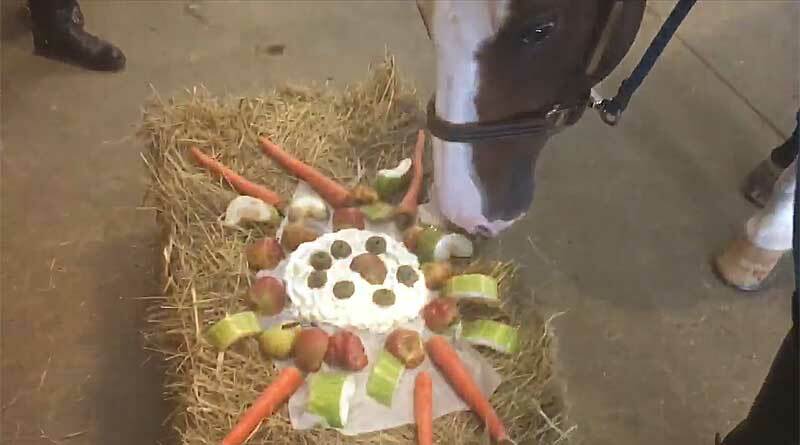 Police horse Blaze chowed down on a range of equine culinary treats to mark his retirement from duties with Nebraska’s Omaha police department. Blaze was a mainstay of the department’s mounted patrol for three years. During his time, he helped to police protests, patrolled President Trump’s visit to Nebraska, and acted as the riderless horse in Detective Kerrie Orozco’s funeral. Friday was his last day, and the afternoon highlight was undoubtedly the tasty selection of treats served up by his human colleagues during a little party to mark his departure. Interestingly, after a careful sniff test, Blaze opted for a mouthful of hay to kick off the celebrations. Blaze will enjoy his retirement on a property in Ohio.